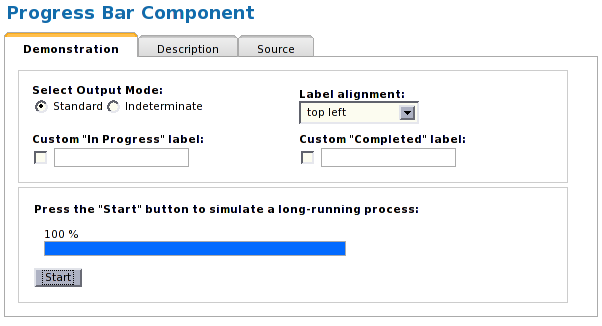 The outputProgress component can be used to inform the user of the current status of a long running task. For example, retrieving new emails from a web based client, or uploading a large data set, or performing a statistic computation on some fields. The mode of the progress bar can be set to display either determinate mode (if the percentage complete is known to the developer), or an indeterminate mode for tasks where the time frame is unknown or cannot be calculated. In addition the look and feel of the progress bar can be customized to a great extend. Not only can CSS classes be overridden as needed, but the text and position of various labels can be modified. The following screenshot is of the ice:outputProgress component demo in component-showcase. In this demo we create a simple progress bar that uses a timed backend task to simulate a long running process. Controls have been added to allow the user to start and stop the progress bar. Download the outputProgress-mode source code here. The progress bar shown was simple and focused on available modes. 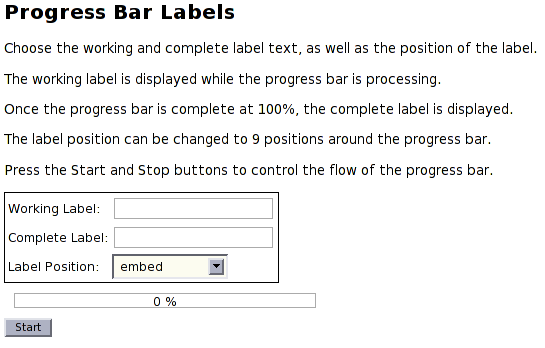 In the next tutorial the ability to customize in-progress and completed labels will be demonstrated. The progress bar has two label types; a working and completed label. While the percentage has not completed yet and the progress bar is still active, the working label is used, specified as the component attribute label. When the progress bar is finished, the completed label will be displayed until further action is undertaken on the progress bar. This label is set through the labelComplete component attribute. Finally the position of the labels (both working and completed) can be changed through the labelPosition component attribute, to any of the 8 available positions. The positions are listed below, with embed being the default. Download the outputProgress-label source code here. Download the outputProgress-style source code here. The next tutorial approaches the progress bar from a different mindset. Instead of using it just for updating the user about a long running task, the progress bar is instead used as a status message. In addition, the next tutorial will look at multiple progress bars on the same page. 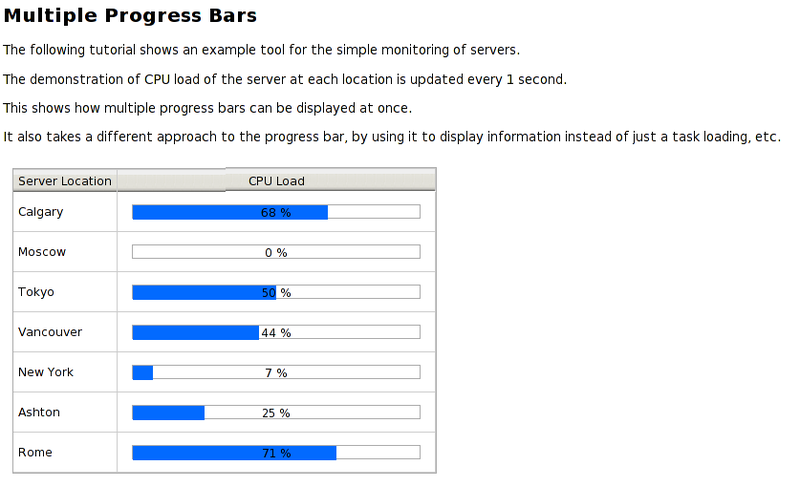 This tutorial will look at multiple progress bars on a single page, and using the outputProgress component to demonstrate a simple CPU monitor, something which is normally not considered for the progress bar. The backing beans were changed to allow for multiple progress bars by breaking up the threaded progress bar bean into a creatable instance, and maintaining a list of them. This list is iterated through by a simple dataTable component at the page level, with one progress bar being displayed for each value. Download the outputProgress-multiple source code here. Component Showcase Available in release bundles Progress Bar example which includes mode setting and label customization. Webmail Available on the demo site Used to display the completed percentage of user created tasks. Copyright 2007 ICEsoft Technologies Inc. All rights reserved.